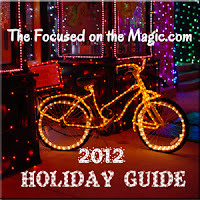 This is the month for contests here at Focused on the Magic. There are so many overlapping, we put together a Holiday Guide for you to see all the contests in one place. The Stella & Dot Giveaway is still going strong as is the $200 HoliDaze Giftaway and the Pixie Vacations and Friends Prize Pack. Both of them have daily entries to increase your chances of winning. So, be sure to head over and enter again today if you haven't already. Are you ready for another great giveaway? 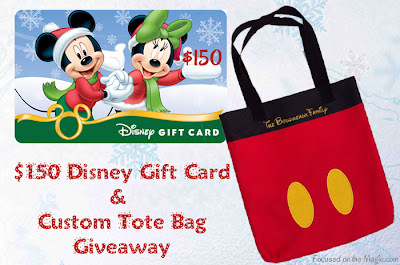 $150 Disney Gift Card & a Monogrammed Mickey Tote Bag ! The contest starts Monday, December 10th, 2012 at Midnight, and continues until Tuesday night, December 18th, 2012 at 11:59PM. 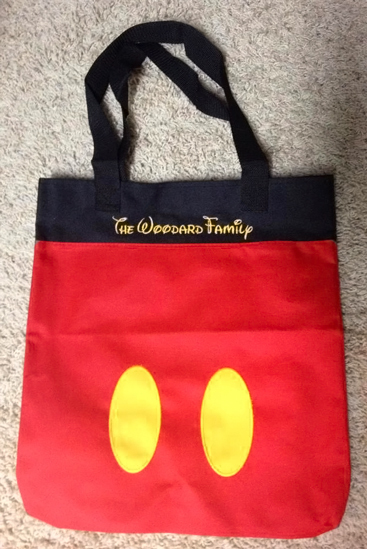 The Woodard Family was kind enough to share with us an example of what the tote bag would look like after it was personalized. If you're the lucky winner you could have it monogrammed any way you'd like. To enter you need to follow the requirements on the Rafflecopter code below, and to encourage full participation and to help spread the word throughout the Internet, there are daily options for you to tweet about the contest and share the contest for more entries! You can even leave a blog post comment for additional entries as well! If I win I'd go dining in the world! I'd buy the Disney Princess Wardrobe Set for girls from the Disney Store! We are starting our disney fund and this would be a great start! Awesome! I need to add to my Disney fund for my next Disney trip!